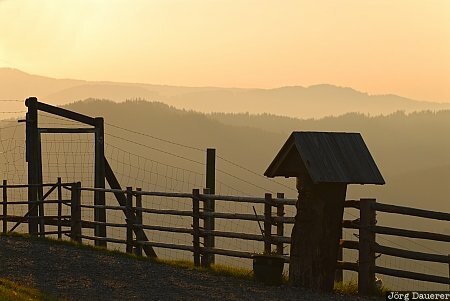 A fence on Magdalensberg and he surrounding hills in the background illuminated by warm morning light near Klagenfurt in Carinthia (Kärnten), Austria. This photo was taken in the morning of a sunny day in August of 2008. This photo was taken with a digital camera.